In most reading, it’s agreeable that sulphur has a strong, fierce energy. It’s associated, stereotypically, with masculinity because of this. Fire, the Sun, and sometimes Saturn are also considered to be the planets and elements most akin to sulphur’s energy. Sulfur Powder has been known in its natural form since the 6th century BC among in China. In Europe, Sulfer was valued highly enough to be given its own Alchemical Symbol, consisting of a triangle at the top of a cross. It was also well known as Brimstone, a word derived from biblical texts, and was often associated with damnation and hell. Spiritual traditions exist around Sulfur as well, depicting it as a powerful aid in preventing hexes or destroying an enemy`s power over you. – Commonly, sulphur is used for purification, and in turn, protection. It is powerful enough, when used to it’s full potential, to be used for banishing magic, and spell breaking magic. – When used for purification, sulphur can achieve a number of things. It can be used to cleanse environments and items, ease negative thoughts, and clean the energy fields of people. 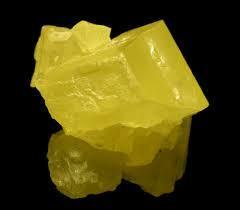 In regards to mental health, sulphur can be used to help purge unwanted emotions and thought patterns, for a time. – In a more drastic form of purification, sulphur can be used to aid in banishing magic. Utilize it to prevent or destroy unwanted spells, to counter opposing magic, and, if needed, it could be used to rid one of unwanted spirits and entities. – It’s important to note that when using sulphur, burning it will smell horrible. It’s known for it’s rotten egg stench; burning sulphur in a closed area should be avoided. – For safety in working with sulphur, this quote was informative. “Elemental sulphur is not toxic. However, sulphur is often found in combination of realgar or cinnabar, which are toxic minerals. Natural or manmade sulphides (combinations of sulphur with other elements and stones) can potentially be toxic also, and cause health issues ranging from respiratory illness to heart damage and others. So it’s best to take proper precautions when handling it as the sulphur may not be entirely free of these minerals,” from here. – It’s important to note that sulphur is highly flammable, and potentially explosive, especially its small dust particles. – When melted down, sulphur will release a toxic gas, so avoid doing this, especially in an enclosed space.